Sometimes big name cigarette brands can be misleading. There is no doubt about their quality, but you simply don't like the taste. Well, it's time to venture out and seek something new. Maybe a brand that's not as famous will do the trick? For example, a cigarette brand that is less known but just as good as the leading names in the market is West cigarettes. West cigarettes are one of the leading brands in Germany. They are American blend filter cigarettes that have been around for more than three decades and today they even support the West McLaren Formula 1 team. 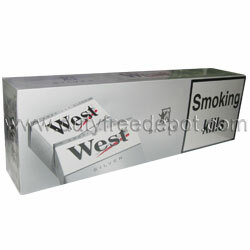 West cigarettes are characterized by the premium blend and their flavorful taste. Two flavors of West cigarettes can now be purchased at Duty Free Depot: West Red, and West Silver. Duty Free Depot is quickly becoming known as a leading online store for tobacco products, as well as tobacco accessories. The store sells all types of cigars, cigarettes, e-cigarettes, spirits, lighters and so on, all of good quality and all for low prices. The store makes a point of helping you save money, both by offering many discounts, deals and coupons and also by maintaining a policy according to which you pay less for an item if you buy a large number of packets, boxes or cartons at once. Duty Free Depot prides itself on its highly reliable, professional and friendly service. Service includes customer service that can be contacted 2:00 AM - 4:30 PM(EST) Sunday-Thursday 1-800-865-7043. In addition, whether you live in the USA, Europe, Asia or Australia, Duty Free Depot maintains a worldwide shipping policy! What could be better? Waste no time – visit Duty Free Depot today and purchase your favorite brand of cigarettes.